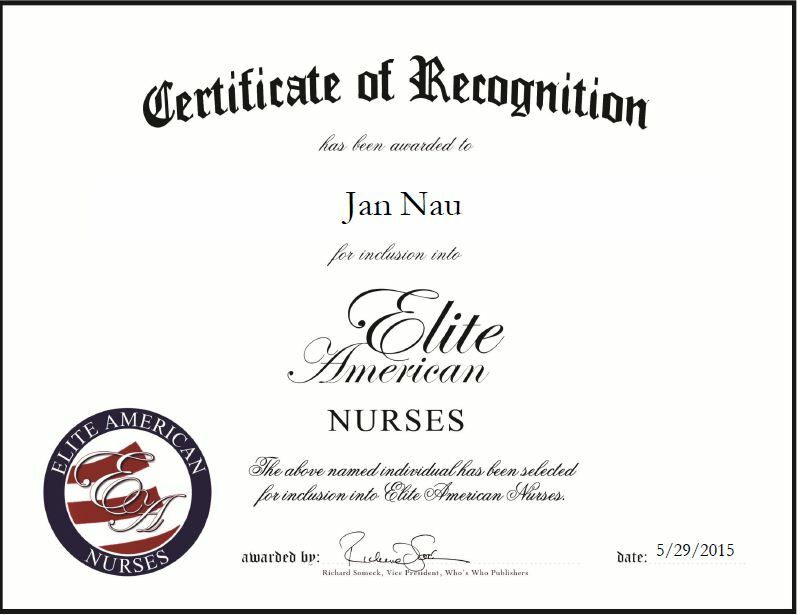 ← Ampai Aimsiri, RN, Ph.D.
Peoria, IL, May 29, 2015, Jan Nau, Registered Nurse at Affiliated Urology Specialists, has been recognized by Elite American Nurses for dedication, achievement and leadership in patient care. Ms. Nau has 49 years of experience and has been in her current role for more than two decades. She is an experienced, compassionate and well-respected urology nurse who specializes in-office doctor’s assistance and medical-surgical nursing. In her role, she is responsible for working with doctors on in-office procedures, assisting with phone work, medical-surgical nursing, and practicing urology. Throughout her illustrious career, Ms. Nau has achieved tremendous success. One of her greatest career achievements was voluntarily starting a patient support group 10 years ago and helping to set up a urological freestanding surgery center in 1990. Ms. Nau earned a Bachelor of Science in health arts at the College of St. Francis and earned a registered nurse certification through St. Francis School of Nursing. To stay abreast of changes in her field, she is affiliated with the Society of Urologic Nurses and Associates. This entry was posted in Registered Nurse and tagged medical-surgical nursing, patient care, patient support group, procedures, urology. Bookmark the permalink.